Managing Partner, Bill O’Malley, believes the greatest challenge facing the Big-Ticket industry is effectively engaging with the younger executive. In my blog postings I will continue to promote servant leadership and provide whatever new knowledge, tips and innovations in Talent Management. I want to see our industry continue to adapt and keep up with the rapid technological changes in the Omni Channel environment that is the new reality. Candidate Tip – Improve your personal brand during times of dramatic change! When there is major change at an organization, it’s never an easy transition for employees like you who remain with the company. After all, you’ve given many months and even years to the business. There’s a good chance you’ve spent more time with your manager and fellow employees than with some of your closest friends during that period. Nearly every executive with a career of significant length will most likely experience a dramatic change or shift within their company. These include; a leadership change, a massive restructuring or a change of control according to Bill O’Malley, Executive Recruiter. However, when there an organizational change – you’ll want to do your best to ensure you’re in the optimal position for future advancement at the organization. If you’re an all-star employee, chances are you’ll be asked to stay on with the company. That can mean a big opportunity for you to achieve growth and career advancement. Therefore, it’s important that you’re prepared to gain the skills you need, to be as successful as possible, during this potentially tumultuous time. According to a Forbes article by John Feldmann, this process, called upskilling, can be a crucial part of a changing company. “By upskilling current employees, companies can fill open positions while retaining their current workforce by creating learning opportunities,” he notes. As soon as you find out that your company is going through change, speak with your manager as well as with any other company leaders you trust with your career. By doing so, you’ll show that you’re eager to learn more about the situation and are willing to do whatever it takes to help the company move forward. After requesting to speak with leadership, take some time to think about the value you can bring to your organization. Reflect on the successes you’ve had, so that you can highlight them during these meetings. By doing your homework ahead of time, you’ll show your manager and others that you have an impressive ability to plan and a commitment to succeeding when times are tough. During these meetings, it’s also important to ask what they’ll be looking for most from the team after the change has been enacted. Their answers can give you valuable information on how you can train and upskill yourself in the coming months. After a reorganization, responsibilities and roles are often condensed, so it’s all hands-on deck. You may find that you’re now responsible for new day-to-day tasks that you hadn’t previously performed. Having spoken with company leadership, you will be one step ahead, with invaluable knowledge to help you succeed in the new environment. The next step is to learn as much as possible and gain the skills necessary for advancement. Helpful websites include LinkedIn Learning and Udemy. Both offer thousands of online tutorials, taught by world-renowned experts, that can truly help you thrive during this pivotal moment in your career and your company’s journey. Beyond learning about potential growth opportunities and taking one-off online courses, you can turn upcoming organizational change into a chance to go back to school or earn a certificate to boost your skill set. While online learning platforms are great for gaining knowledge about specific subjects, getting a master’s degree or a certificate from an accredited institution can make you truly invaluable. Many reputable universities now offer online master’s programs, making it that much easier for working professionals to continue their education. There are many instances where your company can help you achieve this goal. For example, some organizations have tuition reimbursement or assistance programs that can help you earn a degree at a reduced rate. To begin this process, simply read through your employee benefits resource information or contact the human resources department. Additionally, you should initiate a conversation with your manager once you start considering enrolling in an educational program. This will do a couple important things: first, it’ll express your commitment to upward mobility at your company. It will also help you to determine workplace flexibility opportunities, that potentially can include adjustments to your work schedule to make a degree program work for you (and your team). Ultimately, transformation at your company doesn’t have to be frightening, or damaging to your career. Instead, use this period as a time for self-growth and to gain new skills. You’ll then be able to pivot to bigger roles and more responsibilities in the wake of major change. The rapid development of social media technology has had a profound impact on the way business is conducted and how candidates market themselves around the world. As an executive your social efforts are a direct reflection of your personal brand. If you had any doubt as to the importance of having a robust and complete Social Media profile on LINKEDIN, check out the following updated stats on the site. There are now 3.2 billion people using social media, with about 1 million new users every day. The average American spends just over two hours on social media per day, and as a whole, the world’s digital community will spend a combined total of more than 1.2 billion years using the internet this year. 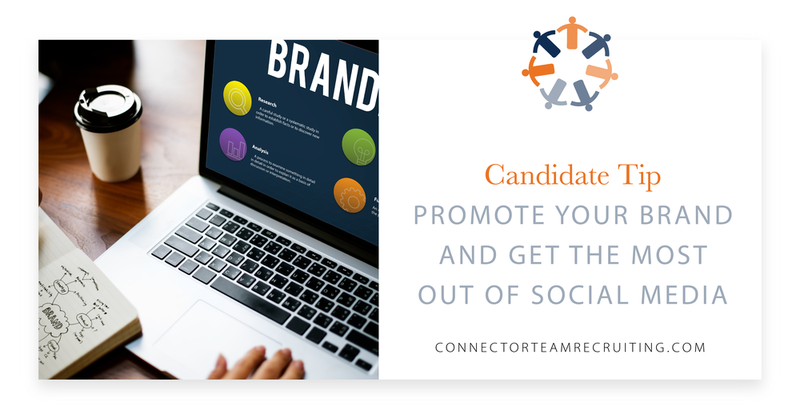 While you should be active across sites such as Facebook, Twitter and Instagram, as a candidate, it’s imperative to implement a strong marketing strategy via LinkedIn. LinkedIn reports over 604.4 million members. 56 percent of users visit LinkedIn on a mobile device. LinkedIn makes up more than 50 percent of all social traffic to B2B websites & blogs. There are 87 million Millennials on LinkedIn, with 11 million in decision-making positions. More than 20 million companies and more than 14 million open jobs are on LinkedIn. If you have ever had any doubt about the power of LINKEDIN and the ability to get your brand message out there, take the time to update your profile. Candidate Tip – What to do when your employer begs you to stay? You’ve just recently resigned and now your boss calls a meeting and wants to discuss why you’re leaving. This is one of the most awkward conversations you’ll ever have and based on our years of experience helping hundreds of executives coast to coast and internationally, here are a few recommendations and observations. It is our belief that there is very little upside in it for you to accept a counter offer to stay. We recommend keeping these two principles in mind in the days following your resignation especially if you’re scheduled for a meeting to discuss your departure. Don’t disclose the salary you’re being offered by the other company. Otherwise you are giving your boss the ammunition to offer you a short-term solution to their problem. “My decision is final – I’ve decided to accept an offer with a new employer and I’ve appreciated the time I’ve worked here. What can I do to make the new person comfortable in my old role? I will do everything in the next two weeks to help train them? This will show that you’re a team player and that you care, it’s the ultimate way to show them that you are committed to them until your last day. When resigning it’s always best not to look back on that decision or show any lack of commitment. I’ve made a decision not to look back on my decision to leave. I’m willing to help transition someone new into my position and ensure a smooth transition. It’s been an honor working at ( ) for the past (____) years and I’ve enjoyed my time with the company and will miss my team members”. Companies and Bosses go into panic mode. They quickly offer you better incentives, like more money or a job promotion–but as enticing as the counteroffer may be, most career experts say you shouldn’t accept. If you your boss does propose a counteroffer, you’ll have to weigh the risks and benefits, and determine what the best decision is for you. Let’s face it “While it’s flattering to be so sought-after, it’s probably not worth the risk in most cases,” to accept a counter-offer. Consider the reason you were looking for a new job in the first place. Was it only about money? What about the new challenge, new colleagues, a new corporate culture, or flexibility at work? Here is the big one? Why did they wait until now to take the time to sit down with you to address any concerns or to attempt to flatter you with a new position or title? One other reason it might not be a smart move to accept the counteroffer: You’d burn two bridges at once. We have found that “the other organization would be unlikely to ever look at hiring you again. Depending how much people talk who you are connected with…you may gain a reputation as a “counteroffer” king or queen and someone who is not decisive. Employers want a short- term fix. We have also found that many employers’ and specifically the bosses will panic and they want you to stick around long enough to find a replacement, and paying a little extra now is worth it in terms of keeping the train moving, versus the potential delays and issues that would arise from an empty manager role. Here is why it can be dangerous for the executive. Once the crisis is over and they have retained you with a short-term fix, they may view you as disloyal and never trust you again. Research shows that most companies view people who have resigned and accepted a counter offer as a flight risk and will keep you around long enough to find a replacement. To them paying a little extra short term is worth it in a tight employment market. While it’s flattering to be so sought-after, it’s probably not worth the risk in most cases. We believe there is very little upside in it for you. Why did your current employer wait till you resigned to call this meeting? I hope this Blog helps you if you find yourself facing this inevitable meeting. Remember, your resignation may have caught your employer off guard. They may have had the impression you were well placed and happy. I am always encouraging clients to have informal meeting at least semi-annually to just talk about career pathing. Turnover can be avoided with great open communication and dialogue. Too often companies don’t know they have an employee who was not happy…until they are staring at a resignation letter. Blog Post by: Bill O’Malley, Chief Recruiting Officer at Connector Team Recruiting. Connector Team is recognized by leaders and leading consultants as the premier search firm in the Furniture | Appliance and Sleep vertical space. Connector Team is an affiliate office of MRINETWORK recently ranked in the Top 10 in Recruitment Firms by Forbes Magazine.